The online accommodation industry is estimated to be worth hundreds of billions of dollars. With an average conversion rate of 3% (and even lower for less known brands), anything that increases booking conversions provides great value. Pricing and Location are the most important factors in picking a hotel. Research by Airbnb, Google, TripAdvisor and others confirm this. 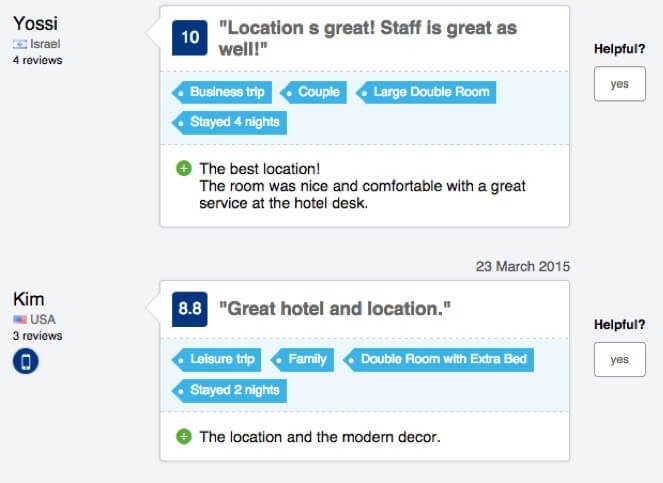 Most hotel reviews written by travelers also start by mentioning the location of the hotel or apartment. Surprisingly, the vast majority of booking sites offer extremely poor insights when it to comes to choosing a hotel location. In most cases only a few basic location references are provided, like “distance to city center”, a list of neighborhoods and an optional map view. However, neighborhood names are meaningless, unless a visitor knows the destination city well enough to remember their location and context. 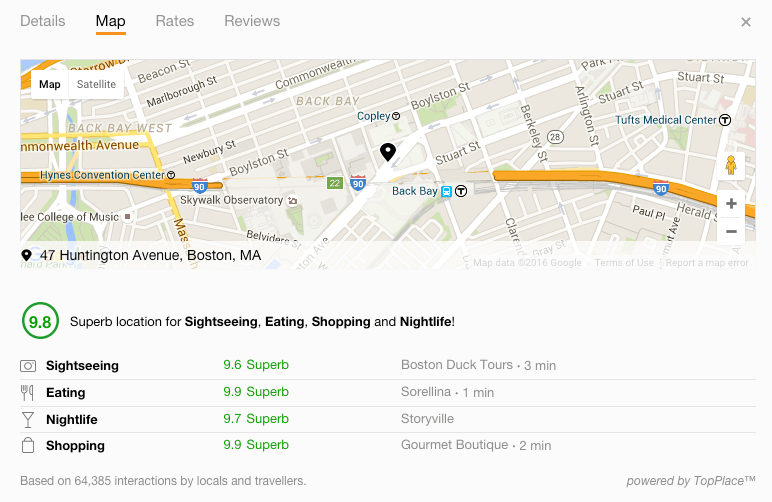 “City center” does not specify the actual area, nor it always means the best and most interesting location. Potential bookers are practically pushed to go elsewhere to find more information about their destination. After a considerable amount of site hopping, a hotel may easily end up booked via a competitor’s site. Especially true nowadays, when leading travel reviews and search sites like TripAdvisor and Google started offering direct hotel bookings. Major Online Travel Agencies (OTAs) spend billions in online advertising every year, often paying up to several dollars per visitor. “Leaking” even a small percentage of those visitors represents an enormous cost – not only in lost marketing money, most importantly in lost bookings. 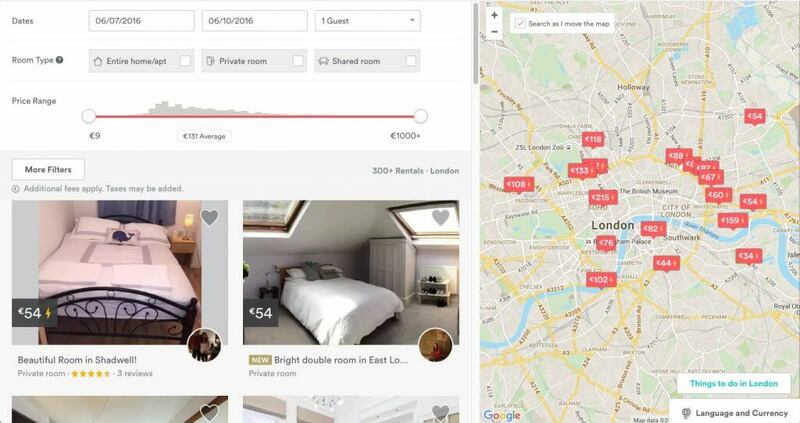 It’s no surprise that some of the fastest growing players like Airbnb, aside from displaying a default map view of the apartments location, have also been working on location relevance since their early days. Airbnb also acquired NabeWise in 2012, a startup working on offering information about city neighborhoods, to enhance the location insights provided to travelers. Another fast growing player is Booking.com, which during the last years has systematically incremented their own hotel location scores visibility. With these location scores, given the relevancy of location for potential bookers, Booking.com offers a superior experience compared to the majority of online accommodation companies, including top rival Expedia. However, while any additional insights about location are helpful, we believe that just saying “Location is good” is insufficient. “Good” for whom and for doing what? A great location to enjoy a city’s nightlife with friends could be a wrong choice, if the purpose is to do sightseeing with the family. Over the last 3 years we have been working on a better solution for location insights in online booking. We called it TopPlace™. TopPlace™ provides location insights of every city area, neighborhood and venue, anywhere. It shows categorized and detailed location scores and descriptions for any hotel or apartment, even for new listings that have not been reviewed yet by guests. To ensure worldwide coverage and high accuracy, we’ve analyzed location data from over 60 sources and billions of signals of activity of millions of people. We have mapped the areas and places that are most relevant for traveler’s basic activities, like sightseeing, eating, shopping and nightlife. One of the products – TopPlace Heat Maps – is successfully being used by KAYAK, helping to choose the right hotel location in just 40 seconds. The results of A/B tests of our clients have confirmed an increase in quality CTR for metasearch companies, an increase in conversions for OTAs, and, almost surprisingly, an even more significant increase in booking value. It turns out that travelers are willing to pay 15-20% more for staying at a location that suites their interests best. Our newest TopPlace™ product – Location Score Elements – has recently been launched with several clients. Instead of just saying “location is good”, it also specifies in detail what is it good for, as well as the top rated popular venues nearby. What else makes TopPlace™ products different?